We have events or barbeques at our house frequently so I'm often in search of ways to dress up our table (or kitchen island). I've also been spray painting anything in my path lately. So, when I needed something to put some fairy wands in that I made for a friend, I grabbed a pickle jar from the fridge, convinced Skylar she wanted to eat the last pickle, washed it out, and spray painted it. 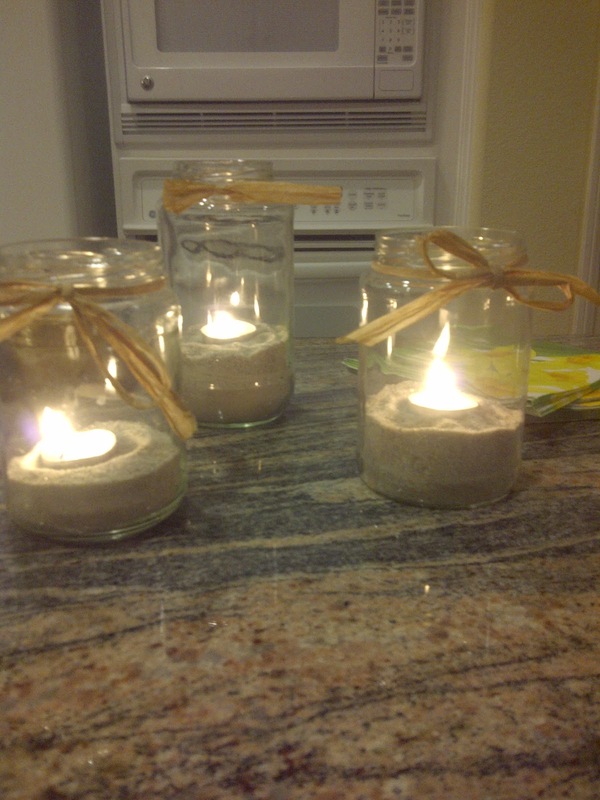 I was officially hooked on re-using jars. So, when I had a ladies event at my house this week, I took a look at all my jars that are "waiting to be painted" and decided to do something with them. I put a little sand from the sandbox in, added a tealight and some raffia, and voila! Love those ideas!! I have a dozen mason jars (that I never used after a failed jam experiment), and I love pulling them out for random things like that. So pretty!